From box CP/CENT/CULT/17. File 03: Typescript proceedings, 1948-1956. 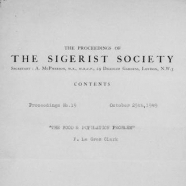 "The Sigerist Society," according to a note on the front several issues, "was formed in 1947 by a group of doctors who felt the need to discuss the theoretical and social aspects of Medicine from a Marxist point of view." CP/CENT/CULT/17/03: Typescript Sigerist Society proceedings, nos. 11-16, 18-19, 21-23, 25, 33-34, 37.